Rana Dasgupta dedicates Capital to “the unborn”. Capital is not just a portrait of a city – it’s a vision of the future. 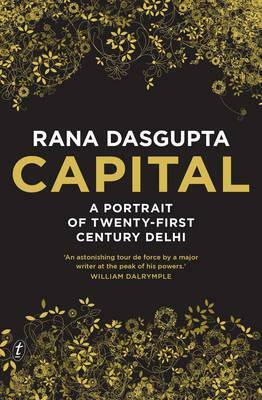 Delhi is portrayed as “hypermodern”, not striving to catch up with the West, but a truly modern city, a megopolis, a place where “…people all over the world can find their destiny most clearly writ”. This is a layered city, its shopping malls and fly-ways, its apartment blocks and ticky-tacky built upon the red bricks of the Mughal forts. The river here is the sacred Yamuna, now a sludge of sewage, plastics, rubbish and chemicals, all the city’s waste freely flowing into it. Dasgupta invokes T.S. Eliot’s The Wasteland, and here, March is “the prettiest month”, and the flowers are the flawless frangipani blooms, placed strategically around the gated and guarded communities, the glass mansions of the moneyed elite. Through a series of interviews, Dasgupta non-judgmentally reveals the attitudes and hopes of Delhi’s rich, the new Indian “middle” classes, not really in the middle, but living at the top, in glassed-in worlds. These people are Dasgupta’s orphans, products of a place born out of invasions, migrations, massive disruptions and upheavals. They are the warriors, fighting for what can be gained, before it is taken. These orphans, “bred out of the baked land”, carry the legacy of immense trauma, of the Partition, that great global event, its effects seeping out across the world. Delhi’s super-rich, like the global super-rich in every country, live rootlessly, without real connection to the land or rivers, or the wider community, keeping money off-shore in Swiss bank accounts, sending their children to American schools. Delhi is a resource that can be exhausted before moving on. For Dasgupta, Delhi is an example of what we are all heading towards. It is a Dystopian view, but toward the end of the book Dasgupta offers hope. This is a vision of the great Yamuna before it reaches the city, flowing clean and vital, under the infinite sky, and the knowledge that it was always here and will endure after the city is gone. Along with this, the certainty that new insights and visions will also be produced in the global world, and that this creativity can be a precursor to Utopian, rather than apocalyptic futures. This is a disturbing, though beautifully written work. An important book for our times; I really recommend it. This entry was posted in Uncategorized on June 13, 2014 by Jane Skelton.